Welcome to our team, Yichen Song! We are happy to welcome our newest team member, Yichen Song, who has joined our lab as a PhD candidate. Yichen previously worked at North China Electric Power University in Baoding, China, and graduated with a major in psychology from State University of New York at Buffalo, USA. In her master's thesis, she investigated the effects of background music on working memory. Starting with her PhD in the Music & Health lab, she will conduct research on the effects of music on the human stress response. From left to right: Katharina Eder, Rosa Maidhof, MSc, Markus Ehrengruber, BSc, and Anja Feneberg, MSc. 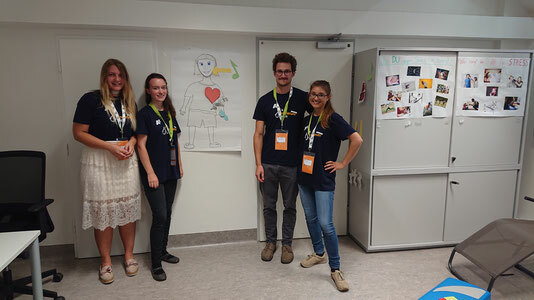 On the occasion of this year's Kids' University (KinderuniWien) we organized workshops for children aged 7 to 12 years, providing a hands-on insight into our current research. Our workshops were dedicated to the question whether listening to music promotes health and well-being. Demonstrations of how we investigate the effects of music listening on stress were followed by the opportunitiy for the children to experience directly how different kinds of music contributed to their own feelings of relaxation and happiness. Moreover, our team learned a lot about the musical preferences of these young scientists! 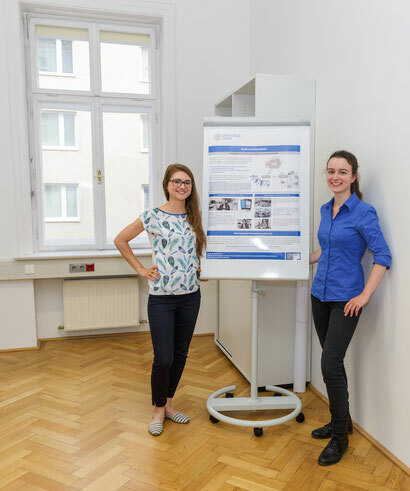 The Outpatient Unit for Research, Testing and Practice is part of the Faculty of Psychology of the University of Vienna. On 23rd May 2018, members of the faculty came together to celebrate the official key delivery and opening ceremony of the Outpatient Unit which is being administrated by Dr. Dr. Ricarda Nater-Mewes. Univ.-Prof. Dipl.-Ing. Dr. Dr. h.c. Heinz Engl, rector of the University of Vienna, Univ.-Prof. Dipl.-Psych. Dr. Barbara Schober, dean of the faculty of psychology, and Dr. Dr. Dipl.-Psych. Ricarda Nater-Mewes, head of the outpatient unit, (from left to right) symbolically opening the outpatient clinic with a large key. Combining applied research and community support, the Outpatient Unit is concerned with evidence-based psychological diagnostics, counselling, interventions, as well as gradual and post-gradual training.  Also the music and health lab is involved in the Outpatient Unit's activities by offering music-based interventions and conducting research on music-related treatment options for diverse patient-populations. We were honoured to present some of our projects at the opening ceremony and to converse on health-beneficial effects of music with the visiting guests. Anja Feneberg, MSc and Rosa Maidhof, MSc (from left to right) presenting a poster on Music and Health. We are happy to welcome our newest team member, Rosa Maidhof, MSc.! Rosa has already supported the Music and Health Lab during her master's degree. She has written her master's thesis on the impact of music listening on heart rate variability. From now on, she will support us as a PhD candidate and extend her knowledge on the associations between heart, health, and music. 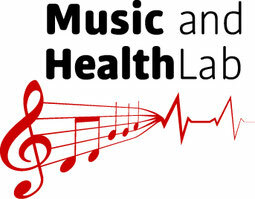 Prof. Gunter Kreutz @ the Music and Health Lab! 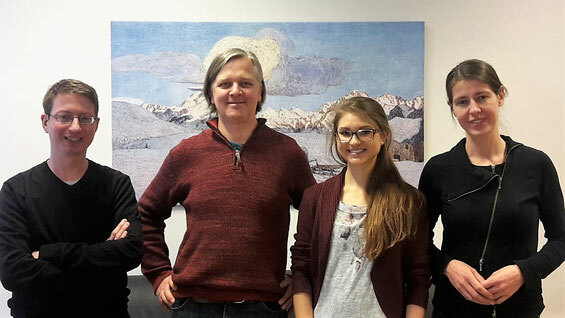 We were pleased to welcome Prof. Dr. Gunter Kreutz in our lab in Vienna. Prof. Kreutz is teaching systematic musicology at the University of Oldenburg. His main research topics include psychological, social and physiological aspects of music making, singing and dancing. He has published numerous articles in the field of music and health. After a brief tour of our newly opened lab rooms at the University of Vienna, Prof. Kreutz enjoyed an acoustical foretaste of the music pieces we use in our current studies. Time went by very fast - so we hope to meet him again soon in the future! As our newest addition to the team, we welcome Jasminka Majdandžić, who has joined the lab as a PostDoc. Jasminka's resesarch background is in social neuroscience: over the past years, her research has generally focused on understanding what drives people to socially connect with others - to affiliate with them, to "tune into" their mental and affective states, and to engage in behaviour which benefits, harms, or pleases them - and importantly, how these processes are mediated on a neurobiological level. Jasminka is excited to now extend her research focus to the field of music, and how it affects emotiones, stress and pain. For our team in Vienna we are actively looking to fill the position of a post-doc (duration of employment: 6 years). Exciting changes ahead of us! With Professor Nater starting his new position at the University of Vienna, the Music & Health Lab will move with him to the World Capital of Music, starting October 1st, 2017. We are looking forward to continue our research at our new home. Stay tuned for additional news! The article Music Listening as a means of stress reduction in daily life (Linnemann et al., 2015) has recently been recorded one of the most downloaded articles in the last 90 days in the Journal Psychoneuroendocrinology. In this article, Alexandra Linnemann and colleagues provide support for the beneficial effects of music listening on subjective and physiological stress in the everyday life of university students. We are delighted to welcome Pablo Enriquez Cerda from the National Autonomous University of Mexico, Mexico City, as a guest PhD student in our lab. He will stay during the summer months in order to prepare one of his research projects back in Mexico. His PhD project is concerned with the potential beneficial effects of music interventions on stress and emotions in the working context. He has for example organized life concerts of classical music in one of the largest companies in Mexico.